​Sphinx Shriners came into being because there was a need for a Shrine Temple in the rapidly growing Greater Hartford area at the turn of the nineteenth century. Freemasonry was strongly entrenched in Central and Eastern Connecticut. Before Sphinx was established, those Masons who desired to become Nobles had to travel to Pyramid Temple in Bridgeport. Recognizing the need for a new Temple, a group of nineteen Nobles gathered at the Masonic Club of Hartford (clubrooms in Hartford Masonic Temple) to form a new Shrine Temple to serve Central Connecticut. In 1896, the Ancient Arabic Order of the Nobles of the Mystic Shrine (A.A.O.N.M.S.) was still a comparatively young fraternity, having been established only twenty-four years previously. Its formation came about at a meeting of held on June 16, 1871 by thirteen Knights Templar and eight 32nd Degree Scottish Rite Masons, at which the decision was made to form Mecca Temple of New York City. Within a year the planned fraternity had become a reality. At the meeting held at the Masonic Club of Hartford, names of the following Nobles were recorded in the proceedings: Frank D. May, Rial Peck, James Jarman, H. B. Philbrick, Charles Andrus, William Marchant, and Sidney Clarke. Rial Peck was appointed as Chairman and James Jarman as Secretary. The first step taken was to submit an application to the Imperial Council for a Charter. During the next month, a delegation from Hartford visited Pyramid Temple to propose relocating it to Hartford. Unsurprisingly, the motion was soundly defeated. However, permission was granted to allow the Hartford delegation to proceed with the plan to form a new Shrine Temple in Hartford. Sphinx was then chosen as the name of the new Temple. The Imperial Council of the Nobles of the Mystic Shrine (which later became Shriners International) granted a dispensation to Sphinx Temple of Hartford on April 13, 1896. The first meeting of Sphinx Temple under such dispensation was held at the store of Noble William Marchant on Allyn Street in Hartford on April 24, 1896. At this meeting, a permanent organization was formed, with Rial S. Peck as Potentate and Sidney Clarke as Recorder. Three hundred and fourteen Nobles registered or were initiated as charter members of the new Temple. All told, four meetings were held while the Temple was operating under dispensation. At a meeting held on July 13, 1896, the members were notified that a Charter had been granted to Sphinx temple. During 1896, two Ceremonials were held in Hartford, the first on April 27, 1896 and the second on October 15, 1896. Imperial Potentate Harrison Dingman, assisted by Imperial Recorder Benjamin Rowell, presented the Charter to Illustrious Sir Rial S. Peck at the second Ceremonial held at the First Company Governor's Foot Guard Armory. Sphinx was the seventy-third Temple established in North America. 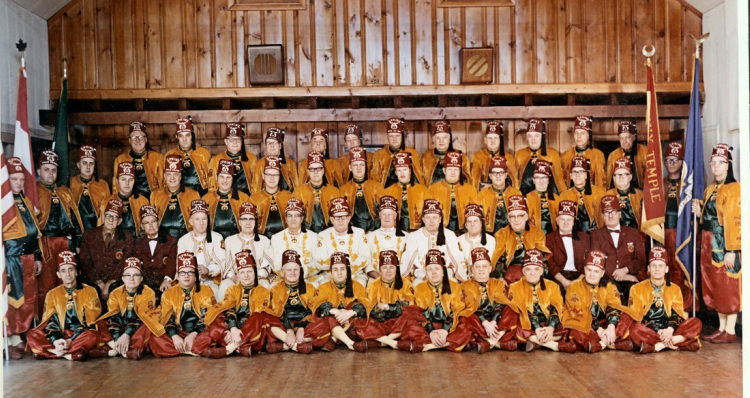 By the close of 1896, Sphinx Shriners had a membership of 414 Nobles. During its first five years of operation, membership grew to 723 members. The Sphinx Shrine Band was formed in 1899. It is the oldest continuously operating band within the realm of the Shriners fraternity. Sphinx Oasis Club, which was the first Shrine Club formed by the members of Sphinx Temple, was founded in 1902. Looking to the future, Sphinx Shrine is actively seeking new members who will continue to support Shriners Hospitals for Children® and build upon the many accomplishments of the past 120 years. Connecticut Freemasons deserve the privilege of becoming Shriners. Organized 1899 ― The Oldest Shrine Band in the Land!